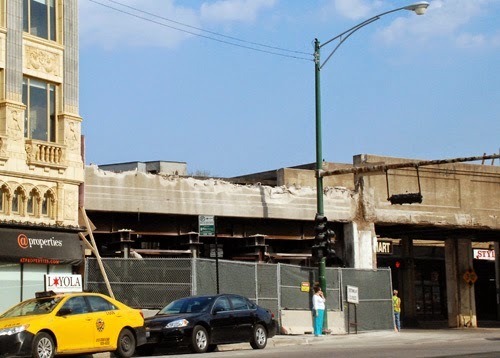 The work continues on the huge reconstruction of the Wilson L station. 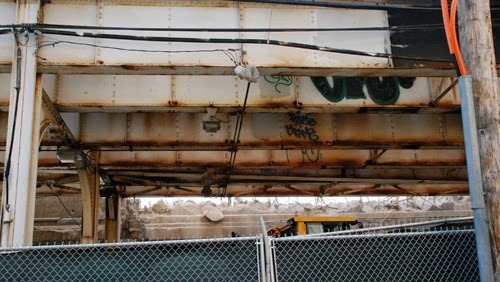 There's some "addition by subtraction" going on at Leland and Broadway, as workers take down the concrete bridge that supported the tracks on which the long-defunct North Shore Line trains once ran. (The Purple Line trains used them until recently; they now share the adjacent Red Line tracks.) We can't wait for the support pillars to come down and make Broadway easier to negotiate, as well as much brighter. You can see in the vintage photo, at top, how dark that corner has been forever, thanks to the double set of tracks and many support pillars in and at the intersection. 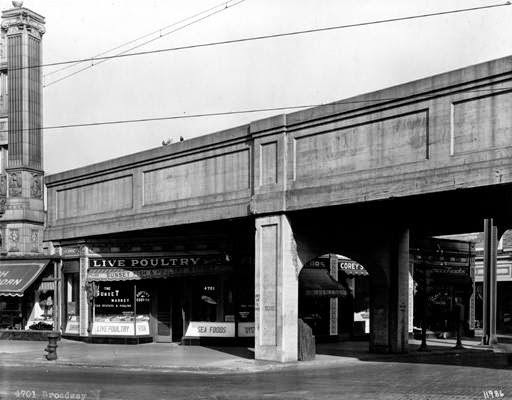 The Rubloff Building, which many of us knew as "The Majestic Store" ("Live Poultry" in the vintage photo), was built in 1922, and was designed specifically to fit under those tracks. So they're taking down some very old infrastructure, indeed. They looked good in the day, but had deteriorated badly, and we look forward to seeing what 21st century technology will look like there. The Rubloff Building was taken down and each exterior part was numbered. 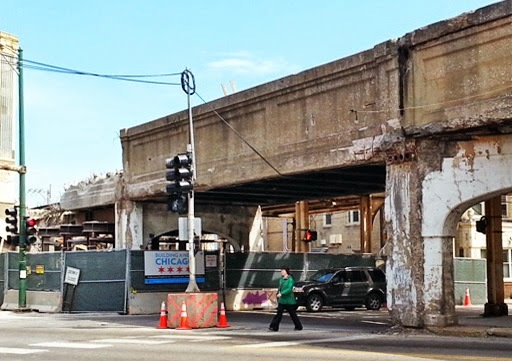 The terra cotta is being restored and will be put back when the new elevated tracks are completed. The footprint of the Rubloff Building will hold the pillars supporting the new overhead tracks.